Marvel Universe is one line I don’t collect regularly. Most of what I got comes from 3 X 2 sales and similar promotions, but nonetheless, I am starting to amass a fairly decent crowd of spandex-clad characters on my shelves. Most of these are figures based on characters from comics I used to read back when I was young and carefree, with a few more thrown in just because I liked the look of the figure. The figures I’m reviewing today fit in both categories and luckily, they come packaged together as part of the Secret Wars assortment of Marvel Universe Comic Packs by Hasbro. This set contains Storm and Nightcrawler, from the X-Men. 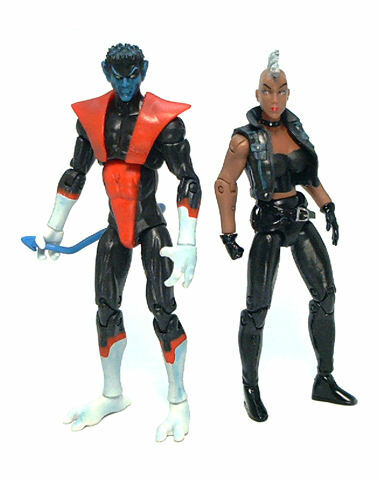 Both figures are representations of the way the characters used to look back in the 80’s, with Storm wearing a Mohawk and black leather biker chick attire, and Nightcrawler wearing his classic black/red/white uniform. With the Marvel Universe line, reuse is the name of the game, as most figures are based off generic bodies with only a few new pieces and paintjobs to produce different characters. In the case of Storm it is quite evident that Hasbro is giving us the same basic body they used for Ms. Marvel, the very first female figure in the line, although the extra bits added go a very long way into making Storm truly unique. While from the ribs down Storm is molded in black plastic, arms head and upper torso are molded in a light brown hue that works wonders in bringing out the muscle tone on the arms and neck. Storm’s facial features are also quite attractive. The lower body is fairly under detailed, consisting of smooth, featureless surfaces. 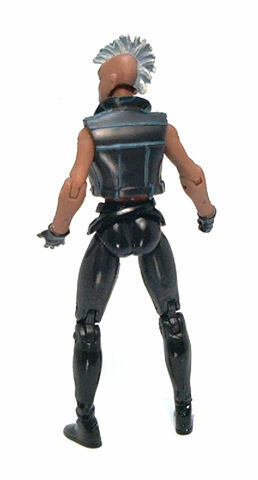 What really adds to the look of this figure are the extra pieces on her costume; the most prominent being a removable black rubber vest, complete with sculpted pockets and buttons and a couple of non-removable belts hanging over her hips. • Ball jointed neck. Great motion range, although not a lot of tilt. • Peg & hinge shoulders. Great range of motion on both sides. • Hinged elbows. Work perfectly and have a good 90° bend to them. • Swivel wrists. No problem here. • Swivel waist. Again, no problem at all rotating the torso. • Ball mounted torso. This is mostly meant to allows tilting back and forth, but it can also provide and a little amount of rotation. • Ball jointed hips (G.I. Joe style). The upper legs go rather deep into the torso, thus limiting a little the motion range of the hip joints. • Double jointed knees. Both the upper and lower hinge work perfectly on each leg. • Peg & hinge ankles. Allow back and forth tilting and swiveling. Even though this version of Storm isn’t particularly colorful, she still has some subtle paint applications going on. Boots, belts and gloves were given a gloss coat of black paint, effectively providing a visual separation from the matte black plastic on the rest of the clothes. 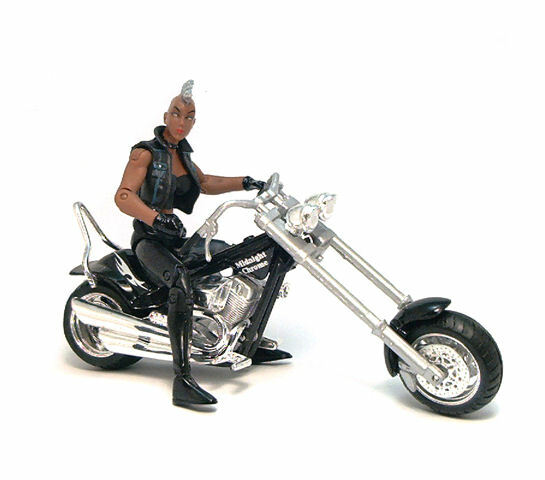 Under the vest, Storm wears a simple, painted-on black tank top, but around her neck Hasbro took the time to paint a silver-studded black leather strap, which at first glance appears to be sculpted, but it isn’t. At the head, the paint job was kept sober and effective, with elegant lash and eyebrow lines painted on each eye and a discreet lip color over her mouth. In an effort to spice up the vacant white-eye look Storm has on the comics, Hasbro decided to paint the eyeballs silver, avoiding the appearance of blindness while at the same time conveying the mystery of her mutant power. Lastly, her Mohawk was painted gray and then given white highlights in a way that really makes the sculpted texture to stand out. 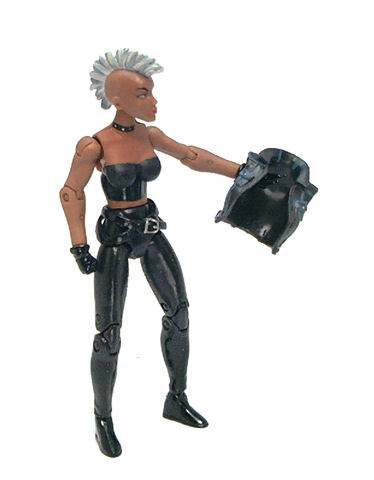 Storm comes with the left hand sculpted with an open palm, while her right hand is sculpted as a fist, which means she isn’t designed to hold any accessory in them, which is rather trivial, considering she comes with no accessories whatsoever. It would have been nice if at least one of her hands had been designed so she could grab something, although there are accessories from other lines she can still wield. Even though the Nightcrawler figure is based on the slim build male body, a good deal of the pieces have more than a few modifications. Leaving aside the obvious, like head, hands and feet, the lower torso had to be modified to accommodate a tail and it has the edge of the red front panel sculpted on. The upper torso also has guides and peg holes to affix the pointy shoulder pads. 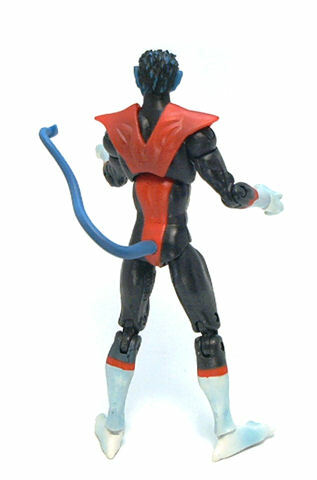 The sculpting is all around good and each muscle group in Nightcrawler’s wiry frame is clearly visible. The face sculpt is appropriately saturnine and it even displays a raised eyebrow, while the hair is sculpted with a spiky texture. The paint job on Nightcrawler is something of a mixed bag. On the positive side, the white parts of his costume (boots and gloves) are painted white and given a subtle, yet effective shading in light blue that looks great. The head was given a wash of black paint that provides very dramatic shading to the face, showcasing the quasi-daemonic nature of the character to a tee. On the not so positive aspect, the red bands separating the black and white sections of the costume look rather muddy, and the edges are not as sharp as I’d like them to be. This comes from the difficulty of red paint pigments to cover darker-hued surfaces when applied without a base coat. Luckily, the red paint applied to the lower torso has a better coverage, and the color matches that of the material the shoulder pads are molded from. 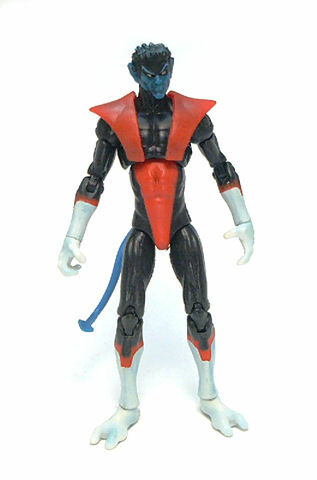 Another minor complaint I have with Nightcrawler is that in the comics, the front of the costume clearly forms a red “V”, starting at the shoulders and ending at the crotch, but on the figure, there isn’t a pointy black shape defining the inner edge of the “V”. Instead, the red shoulder pads end at the edge of the ribcage, leaving a flat black shape right above the belly. I guess the cost of one more paint operation to complete the outline would have eaten into the budget for this set, so, I’ll just pretend this is some sort of costume variation. After all, it the outline at the chest does kind of match similar patterns at gloves and boots. • Ball jointed neck. Excellent, as it has free rotation and it even allows a decent amount of tilt, to the sides. • Double peg & hinge shoulders. Excellent range of motion, although the rubber shoulder pads can get in the way for some specific poses. The lower peg provides a very useful rotation point at the biceps. • Swivel wrists. Full 360° rotation on both hands. • Swivel tail. The piece is unarticulated, but it can rotate freely. • Ball mounted torso. Allows tilting back and forth, as well as sideways rotation. • Ball jointed hips (G.I. Joe style). Again, the upper legs go rather deep into the torso, limiting the motion range at the hips. • Double jointed knees. Both joints work as well as can be expected. • Peg & hinge ankles. Due to the figure design, these can’t really extend or retract the feet all that much, but rotations is completely unhindered. 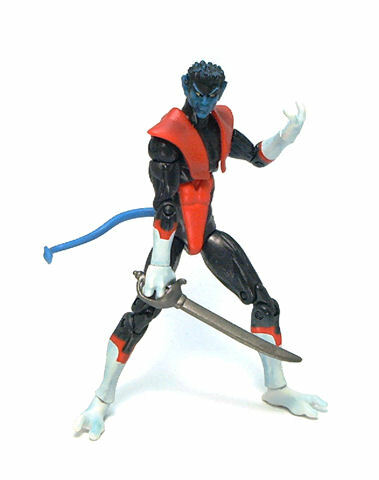 Even though articulation is pretty good, Nightcrawler is one of those acrobatic characters that would have benefited from a more versatile hip joint design, but as a rule, Marvel Universe figures favor shoulders joints over hip joints (a situation that reverses for movie tie-in figures, which have better hip joints and so-so shoulders). Also, the gap between upper and lower torso can be too conspicuous at times, especially in crouching or leaning stances. 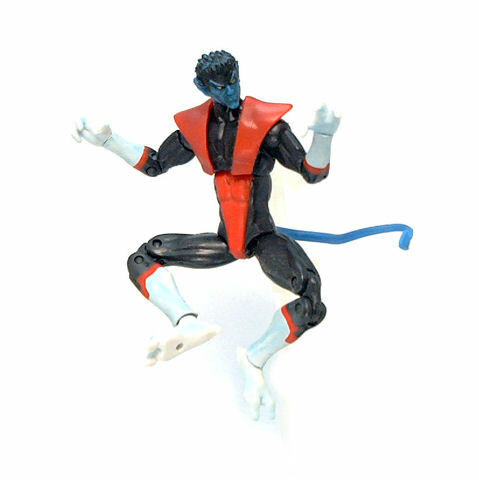 Like Storm, Nightcrawler doesn’t come with any accessories, although the right hand is sculpted in a gripping pose, which at least opens the possibility of equipping him with something borrowed from other figures or just hang from a piece of wire. 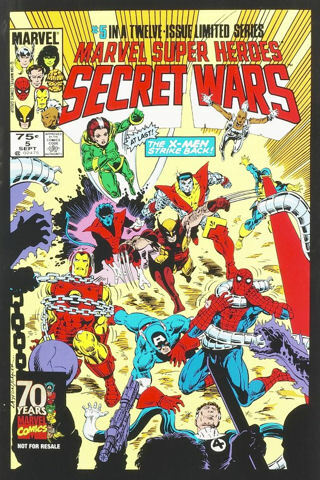 The set also includes a reprint of the #5 comic in the Secret Wars series, a story arc I remembered being better than it actually is. 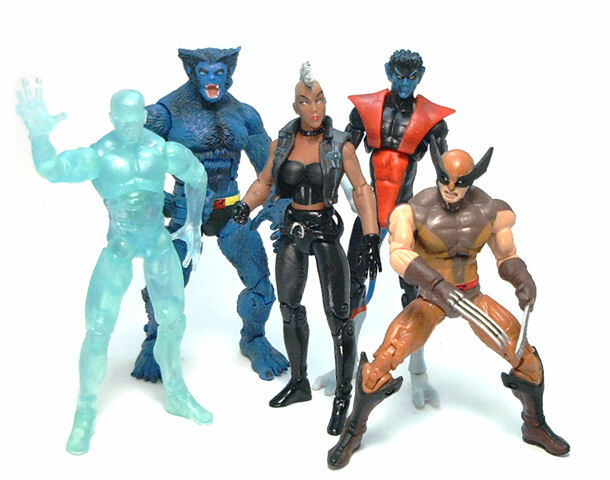 Leaving the comic critique aside, I got this pack mostly for the Nightcrawler figure, even though Storm turned out to be the better half in this set due to her cleaner, simpler paint job and the fact that her articulation level is quite consistent with her character as portrayed in print. If you are an X-Men fan you will definitely want to get this Comic Pack, although choosing a set at stores can quickly turn into a balancing act when trying to pick one with a good enough paintjob on both figures. I really expected the scores to be the other way, but after reading, I get it. You know everybody is going to ask where the bike is from….